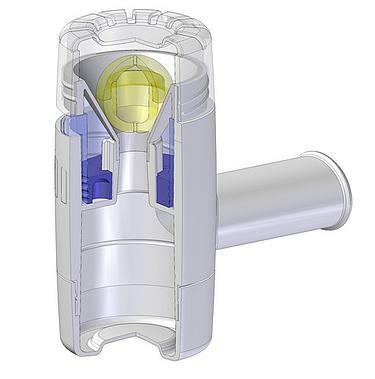 Pulmonary function improver device for asthmatic and respiratory problems Postoperative use lung training to increase vital capacity and lung function, avoiding postoperative complication (for example postoperative inflammation). Compared to previous models, this device is not sensitive to motions during usage. There is no need to adjust the setting angle for proper use. 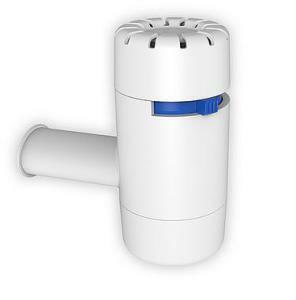 The needed amount of exhaled air and the right pressure can be adjusted during use. As a result of exhalation a vibration causes oscillations inside the house. 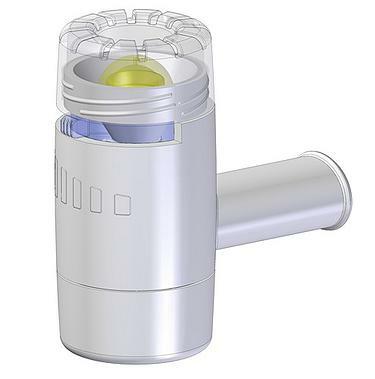 This causes a vibration in the airway walls, which in turn facilitates the movement of secretion up the airways, consequently improving lung function and oxygenation. PULMOTRAINER® can be used long term with no harmful side effects, especially recommended during Spring/Fall season. Unlike other machines the PULMOTRAINER® is usable in any position than just one. Usage is easy, not sensitive to sifting while using. The user does not have to bother with setting the right position. You can set the position of the ball inside the PULMOTRAINER® with the scale on the side depending on you current lung capacity. So both children and adults can use it! Do not use this product when you discharge plenty of thin, watery sputum. Breathe still while using this product, avoid sudden or fast respiration. PULMOTRAINER® does not need external power source. Easy to carry, pocket size, portable. Non-corrosive, made from harmless material.